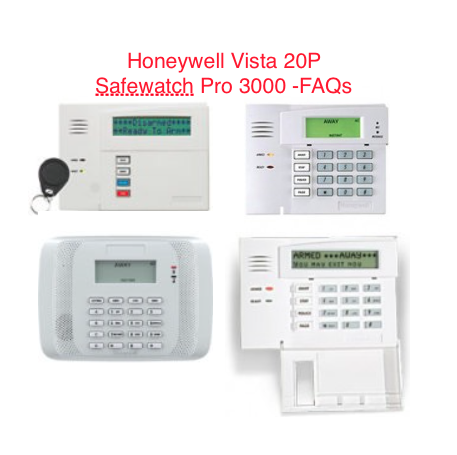 Also known as Safewatch Pro 3000, the Honeywell Vista 20p Control Panel is one of the more common panels available, and it’s quite obvious why. It offers numerous end-user and installation benefits. Do you own this panel, or are you thinking of getting it? Let’s quickly run some of the most frequently asked questions so you can get to know this panel even better and learn how to control the system’s functions with your keypad. How many burglary-protection modes are available? Stay – Use this mode to protect the perimeter of your residence while you’re at home. There’s also a slight delay in the entryway. This means there’s a certain amount of time your system will wait before triggering an alarm, making it the perfect mode to keep activated as you go about your day at home. Instant – This mode is very similar to the Stay mode, except that the delay is turned off. Night-Stay – This mode is also similar to the Stay mode. When Night-Stay mode is activated, the perimeter is armed as well as select interior spots of your residence, keeping you and your loved ones protected during the night. Also, the entry delay is enabled. Away – This mode is perfect for when you need to leave your house unoccupied as you run errands, head off to work, go on vacation, etc. In this mode, the perimeter and all all available interior spots of your residence are armed. Entry delay is also enabled. Maximum – This mode is similar to Away, except there is no entry delay. How do you arm/disarm these modes? To arm any of these protective modes, simply enter your user code followed by the appropriate arming key on your keypad. To disarm any of these modes, just enter your user code followed by the OFF key on your keypad. Your user code is 4 digits and was assigned upon installation. If your keypad displays “Not Ready,” what does that mean and how can you fix it? The “Not Ready” signal may appear when you’re trying to arm your system. This means that there’s an entrance (window, door, etc) that’s inside the zone you’re trying to protect and it’s open. To fix this, simply close the open area. The system will let you know it’s ready to arm when the “Not Ready” signal disappears and an indicator light comes on. Sometimes, you may have everything closed and still get this reading. That would be because there could be motion in front of the motion detector, causing it to trip. Or it could be that you’re missing a magnet, so the system thinks a door or window is open. Is there a way to arm my system quickly? If your installer programmed the system, you can use the “#” key and then press the appropriate arming key, rather than needing to type in your 4 digit security code plus the arming key. How can you set up your system to be alerted when doors or windows are opened? Chime mode is a great way to be notify if perimeter doors or windows have been opened. Three tones/sounds will emit from your keypad should a door or window open. To arm your system to CHIME mode, enter your 4 digit security code plus the appropriate CHIME button on your keypad. How can you silence a low battery warning? A low battery warning sound will emit from your keypad when you need to replace battery. To silence this sound, simply push the OFF key, but don’t forget to change your battery! A red light is flashing on the keypad, what does that mean? When a red light is flashing, that means the system is currently armed in STAY or AWAY mode. A green light is flashing on the keypad, what does this mean? A green flashing light indicates that the system is disarmed. What is a protection zone? Zones are areas of the system/property that are governed by a sensing device. How do you arm your fire protection? If you’ve installed it, fire protection is always active, and an alarm will sound if the system detects a fire condition. You can manually initiate a fire alarm by pressing the test button. How do I change the master code? Type in the current master code, then 802, then the new master code twice. (Do this without any pauses and you should hear a confirmation beep.) If it’s not working, perhaps you aren’t using the master code. How do I add a secondary user code? Type in the master code, then 803, and then the new user code once. (You should hear a confirmation beep.) Do the same thing using 804, 805, etc. for more users. How do I remove a user code? Type in your master code, then #63. Then follow the prompts. Type in your master code, then 6, then #. Or type in your master code, then 6, then the zone number you want to bypass. How do I reset the system after an alarm? Type in your code, then push off, then type in your code and push off again. Learn more about your control panel’s features so you can better utilize all of the advantages it has to offer. If you happen to have a question about your Honeywell Vista 20p Control Panel that we didn’t answer in this blog post, be sure to leave us a comment below, and we’ll be sure to answer it. Feel free to check out the Honeywell Vista 20p Control Panel user manual by clicking here. As an Authorized ADT dealer, our number one goal is to keep your residence or business completely protected. If you are interested in upgrading your security to the latest ADT technology, get backup batteries for your system, or even get a system installed if you don’t have one, visit our website today. When we armed the system it shows an alarm “fault 02”. Please can you give an advise to solve the problem. Fault 02 means that zone 02 (probably a door) is open (or at least the system thinks its open because maybe its missing a magnet or the alignment is off) If you need a new magnet you can get one here. I’m looking to buy Vista P20 keypads . One will be downstairs. We were going to use the second Vista P20 in the bedroom. Do you have any other suggestions? We currently have 4110 with 2 keypads and need to change it. Your zones are programmed with a specific zone type. If you want the change the zone type from a perimeter zone to an entry/exit zone you will need a technician or our phone tech support to walk you through advanced programming. If the zone is already an entry/exit zone and you want to change the delay time then you will need help from a technician to change the delay time also because its also in advanced programming. When we are at home and the system is not armed, the Ready LED is green 99.99% of the time. Every now and then if turns off for a few seconds, and then comes back on. We have recently replaced the batteries in the system. It is a VISTA-20P/PS Series alarm. Is this normal behavior? It is normal for your system to show not ready if there is motion in front of the motion detector. It only lasts a few seconds because once the motion stops it returns to ready again. My vista keypad shows a zone. This zone does not respond when that door is open with three beeps like the other zone doors do. Also, the keypad is stuck at that zone # and you can not get the keypad to allow you to punch in anything at all. It just beeps when you hit the keys on the keypad. The keypad might just need to be replaced with a new one if cannot be changed. You could also try powering down the entire system and then power back up and see if the issue continues. Does turning off the AC power on the Vista 20 P to change the battery delete any users, programming, etc., or will all of the settings still be in the system when the power is restored ? All the settings will be saved when you power it back up. Kinda like if you turned a computer off and then back on again. How can I set up the system to monitor the status of a sensor but not alarm. I have a wireless sensor to add to my garage door. I have a lan connection to the Vista panel and would like to be able to see if the sensor on the garage door is open or closed. I do not want it to alarm if opened as it would take too long from the opening to get to the panel to disarm the system. I just purchased a house with an Ademco Vista SE security panel. I did not get the master code or the paperwork with the house. Can I reset the master code using the Installer code? Hello, I have a Vista 20p in a house I just moved to and do not want monitoring with ADT, therefore the FC code is showing as expected. However, I keep getting alarms out of nowhere and message “fire check 01”. Is this something as simple as checking/cleaning all the smoke detectors to see if they are dirty? There’s multiple smokes on a 2 floor residence. How do I know which ones are on zone 1? They all look the same (esl 521) Thanks in advance. You probably need to replace one or more of them. They are all probably on zone one. If you look at them on the ceiling you might be able to see which one doesnt have a green light flashing every minute or two. If it is different that is probably the culprit. We can send you the link the replacement smoke detector you need and you should also have us help you with the programming to remove your FC error unless that doesnt bother you.